The first Sunday of Advent quickly approaches, and the dawn of a new liturgical year lies just beyond the horizon. As a faith community, we prepare to celebrate the birth of our Lord. As survivors, we look to new beginnings, and everything the Incarnation promises us. So why is Advent so important to survivors? For starters, it reminds us of the wonderful things that can happen when we say, "Yes," to God's will. When the Angel Gabriel told Mary that she would bear a son through the Power of the Holy Spirit, she didn't flee. She didn't reject Him. The same way that Father Walter Ciszek said yes to God's will, even through the decades of his imprisonment in Russia, we too can say, "Yes" to God's will and accept that even our suffering and PTSD is part of God's plan for us. Because the Blessed Mother said, "Yes," Jesus Christ took human form. And since the Lord is both human and divine, that means Jesus understands everything that it means to be human. Of course, it's through the divine Christ that our suffering is redeemed. But first, the Lord had to take human form and endure his Passion. He knew everything that was coming His way, but he, too, said YES to the Father's Will. Father James Marin, S.J., has a very insightful commentary on suffering. One of the things that jumped out to me was Fr. Martin's observation that, "Jesus feels the need to pray three times in Gethsemane before he reaches a sense of peace." I think that's quite telling for us as survivors, in that it means that it's okay to struggle with the heaviness of the crosses we have been asked to bear. Christ even physically needed help carrying the ACTUAL cross from Simon. So if the human Christ himself struggled, then He understands our struggles. Of course, through His resurrection, the Lord overcame the trauma of the Cross, promising New Life for those who believe in Him and accept the Father's Will. It's that new beginning—and the opportunity for new life—that the new liturgical year brings us, starting with Advent. 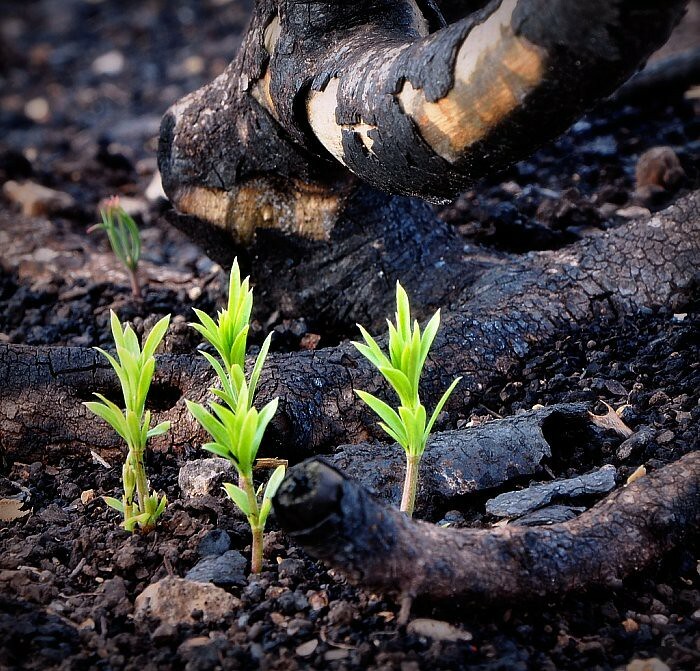 The same way that a forest springs to life after a devastating fire, our traumas have created fertile soil for our new lives to grow. Finding our "new normal" is difficult. It starts slowly at first. But with the benefit of time, the gift of faith, and the Healing Grace of our Heavenly Father, we can move forward on our healing journeys. It starts by saying, "Yes," accepting that even the hard parts are part of God's plan. So as we approach our four Sundays of Advent, how will you prepare to welcome the Lord into your life? How can you make a new beginning in your recovery, or contribute to someone else's? How will you say, "Yes," to God, and let your new life begin to sprout?